Good morning, everybody! We start today’s episode with a recap of Willie opening the mystery box, and then we cut to the next morning, with Liz and Jason talking in the drawing room. Make sure you enjoy the daylight, because the sun’s going to set again in about eight minutes. Unfortunately, she trips over the word “probably”, which is a shame, because it’s the best line of the day. Liz is played by Joan Bennett, who was a famous film star in the 1940s. She was known for film noir roles, playing tough broads opposite Edward G. Robinson. She also played Spencer Tracy’s wife in Father of the Bride, where she was billed above Elizabeth Taylor. 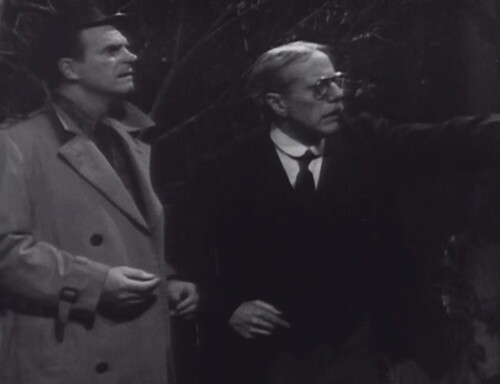 It was a big deal when Dark Shadows premiered with a movie star in the cast. She’s usually a lot better than she is today. Liz suspects that Jason knows where Willie is. He gives his word, and she scoffs. He reminds her, “I haven’t said a word to anyone about our agreement.” She barks, “You were paid very well for your services, and our ‘agreement’ was that you were never to return to Collin. Wood.” Ah, well. Everybody has an off day once in a while. Then we get a scene with Mrs. Johnson, who’s lovely. She’s the most realistic character on the show. Liz and Jason are playing kind of a high-camp melodrama, and Mrs. Johnson couldn’t care less. She doesn’t get involved in mysteries and secrets; she’s mainly a talk-to character, who can deliver information from one person to another. 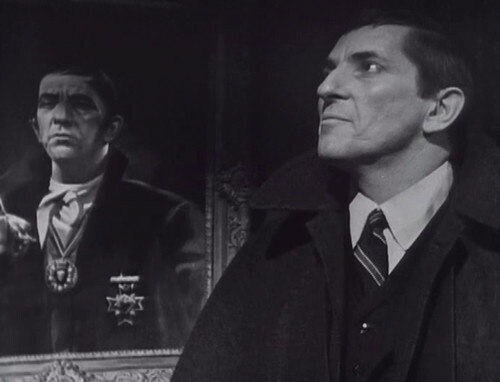 And that’s what she’s doing here, telling Jason about Willie’s interest in the portrait of Barnabas Collins — especially the jewels that Barnabas is wearing. Willie asked a lot of questions about the legend of Naomi Collins, who was given precious jewels by a pirate, which she wore to her grave. This is news to me, and it would probably be news to Naomi, but Jason is intrigued. Mrs. Johnson says that Naomi’s buried in the old cemetery on Eagle Hill, five miles north. You’re going to want to keep an eye on that cemetery, because it’s going to drift closer and closer to Collinwood, until it’s practically in the backyard. So we cut to the Eagle Hill cemetery, and hey, it’s night already. We’re back in the mausoleum, and — oh, God. The caretaker. Okay, then. Folks, this creaky old man is the caretaker of the Eagle Hill cemetery. He only appears in a few episodes, but damn if he doesn’t make the most of it. And oh, how I wish this wasn’t happening. One of my goals for this blog is to encourage people who haven’t watched Dark Shadows to give it a chance, and to appreciate what’s awesome and fun about it — the eccentric actors, the crazy plot twists, the general lunatic energy of it all. And right away, day two, along comes the god-damned caretaker. I’d forgotten all about him. We’ve just unleashed an ancient and primal terror on a wealthy soap opera family. Mayhem will ensue. But first, let’s watch a day player shuffle around, spreading thirty seconds of dialogue over a five-minute scene. 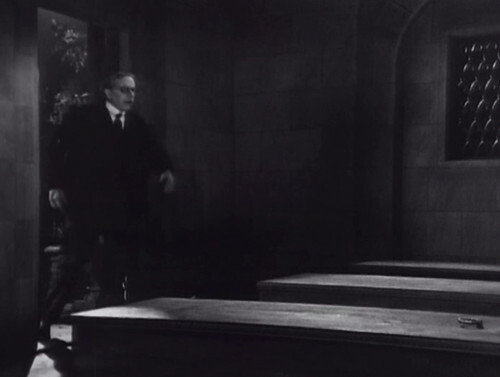 Jason arrives at the graveyard and strikes up an endless conversation with the caretaker. The key talking points are that the living must leave, and never come here again, no one may ever come here again. Also: Evil, evil, disturbing the dead and so on. Jason wants to look in the mausoleum where Naomi Collins is buried. The caretaker moans, “Evil — evil hovers there! Can’t you feel it?” Jason says, “No, I can’t say that I do,” and goes inside. Jason, bless his heart, is trying heroically to save the scene. He walks in and looks around as if he’s considering renting the place. See? Adorable. Look at him just standing there, acting away. Okay, back to Collinwood. 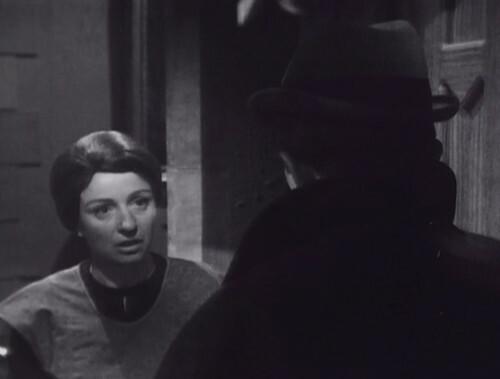 There’s a knock at the door, and Mrs. Johnson opens it to find a stranger, who asks for Mrs. Stoddard. We can’t see the guy’s face yet, but Mrs. J looks stunned. Flustered, she invites him in and takes his hat. He explains that he’s a cousin from England, and she heads upstairs to tell Elizabeth that he’s here. BOOM! And that’s how you end an episode. There are a couple fun ones in this episode. One’s nitpicky but amusing — the hand that reaches up from the coffin to grab Willie’s neck wears the black onyx ring on the left hand. Barnabas wears the ring on his right hand, as you can see in the portrait. 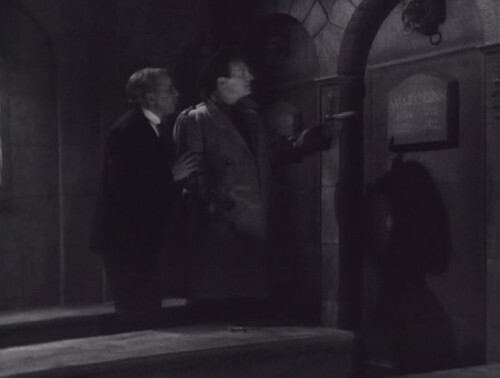 When Jason and the caretaker enter the mausoleum, Jason points to the wrong grave markers as he reads the names aloud. In yesterday’s episode, we saw that the plaque above the left coffin says Sarah Collins, the middle coffin is Naomi Collins, and the right coffin is Joshua Collins. And now Jason walks in, points at the plaque on the left and says that it’s Joshua’s. The plaques are very clearly marked with huge block letters, and he’s looking directly at it from two inches away. Gentlemen, what more can we do for you? Confidential for Women was cancelled in July 1966, and A Time for Us in December; both were replaced by game shows. 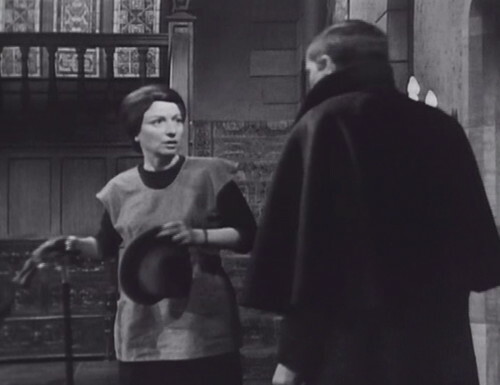 On April 3, 1967 — just a week before Barnabas’ introduction — ABC cancelled The Nurses, and moved Dark Shadows to the 3:30 timeslot. On the new schedule, there were only two soap operas on ABC. At the time, CBS had six soap operas on the schedule, with a seventh coming in June 1967; NBC had four soaps. So at this point, Dark Shadows is airing at 3:30 in the afternoon, between General Hospital and The Dating Game. Dark Shadows’ competition is the CBS mystery soap opera The Edge of Night, and the NBC celebrity charades game show You Don’t Say! Dark Shadows will stay in this timeslot until July 1968 (episode 536), when the show returns to the 4:00pm slot. I love the way Mrs. Johnson delivers lines like “I know what I see when I see it” (a nice reversal from Abbott and Costello Meet Frankenstein, whether intentional or not) and “You wouldn’t get two words out of me about my family.” Wry and funny and they sum up her character, someone self-assured and no-nonsense, not afraid to gossip but still makes sure you know your place and basically she’ll talk if she feels like talking. Her own life is her affair, but the “family,” well heck, given her likely wages, she has to get *some* fun out of it! The caretaker is on the other end of the spectrum. He’s played by stage actor Daniel Keyes, who was in the film version of “1776” along with David Ford (Sam Evans who we should be meeting next week, and later Andre Dupres), Virginia Vestoff (Samantha), and Emory Bass (Mr. Best). He performed in plays by Eugene O’Neil and Robert Anderson, often as no-nonsense authority figures or business types (and his role in “1776,” where he gets the line “We’re a congress, Mr. Adams, not a literary society” when Adams defends part of the Declaration for its stirring and poetic effect, was along those lines). So my theory is that, with the glasses, fake moustache, and dialogue (lines like “Evil! Evil!” don’t allow a lot of subtlety), he just let his inner ham go. But here’s another way to view the caretaker. 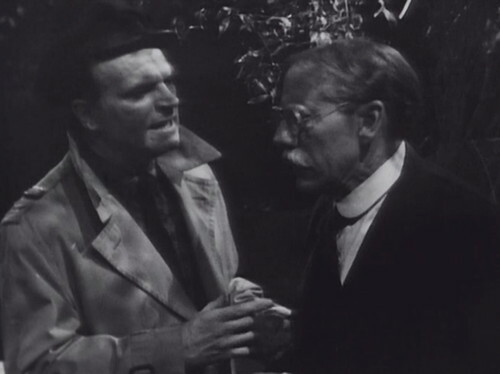 I looked him up on the Dark Shadows wiki, where amusingly someone clarifies that he’s not senile, just “intellectually overburdened.” He’d already been in a handful of episodes during the Laura/Phoenix storyline and was just as prone to fearful comments full of portents and omens and bears, oh my. So my take is that at this point, he’s the only character who knows he’s in a Gothic. 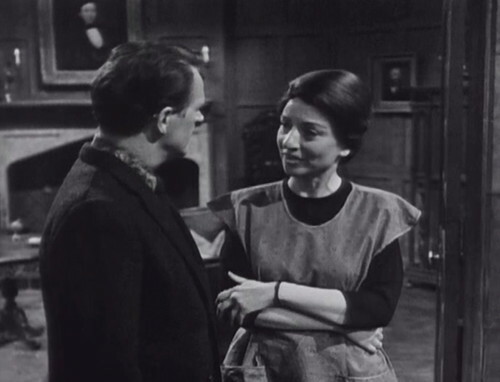 Oh, Victoria “Had I but known” Winters has semi-inklings (I’d have to watch the previous episodes to see if she ever stands before an upper story window in a nightgown clutching her hands). But the caretaker knows it, and carries it out with family pride, ever since the burgomaster told his sorrowful father to take his farm implements home, they were disbanding the mob. Besides, Maria Ouspenskaya won’t respond to his fan letters. 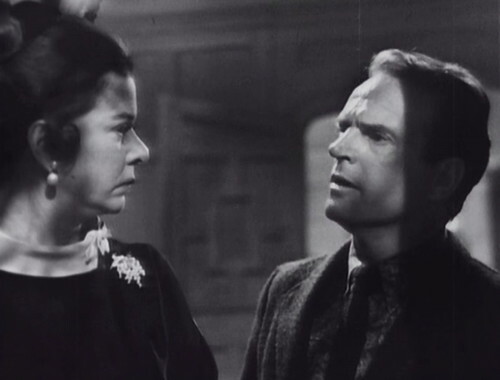 So Elizabeth and Jason are in a high camp melodrama, the sort of situation that often showed up on any soap (radio or TV); the caretaker is moaning about evil and waiting for Una O’Connor to relieve him; and Mrs. Johnson, instead of following his lead and going all Mrs. Danvers, sticks around just because the Nelsons and Donna Reed are too boring to work for. Yes! I was going to talk about Mrs. Johnson and “You wouldn’t get two words out of me about my family,” but it’s a line that you can’t really explain unless you see her performance. She’s phenomenal. I like your take on the caretaker — basically asking the “Rosencrantz and Guildenstern” question: What kind of story is he in when he’s not shuffling around and wasting our time? They really seemed to up their game with the arrival of Barnabas just in terms of presentation — the lighting, the shadows, the way they ended scenes.